According to legend, Wing Chun, a form of martial arts that focuses on in-fighting and defensive combat skills, was created during the 17th century by a Buddhist nun named Ng Mui. Legend has it that she narrowly escaped the destruction and attack on the Shoalin Temple in Southern China, the reason she ended up developing intense self defense fighting skills. During this time, accurate historical recollections states the Shoalin monks were being severely pressured by the Manchus due to their dedication and loyalty to the Ming. Because of this circumstance, many of the historical records associated with the early creation and teachings of Wing Chun including those related to Ng Mui, are mysterious and hold a kind of mystical reverence still to this day. Later, in 1893, Ip Man, also called Yip Man by some, was born and grew up to become the most respected sifu and master of Wing Chun the world has ever known. He knew the art of Wing Chun was going to slowly die if it was not taught to the world. He accepted the legend surrounding Ng Mui about her influence on this form of martial arts and relayed as such to all of his students, one being the legendary Bruce Lee. Ip Man’s techniques became the basis for the styles and techniques created by Bruce Lee. Ip Man taught Wing Chun until the age of 70. He died in December of 1972, leaving behind an amazing legacy and a son, Ip Chun, that chose to carry on his father’s dedication to Wing Chun. Ip Chun is still teaching Wing Chun techniques today in Hong Kong. Most of these techniques are based on in-fighting, a combat circumstance that places opponents in close proximity of one another as though in small room. Most of the movements used in Wing Chun are made mostly with the upper body, arms and hands. While few kicks are used, many still speak of Wing Chun as being one of the deadliest forms of martial arts ever taught. One reason for this belief is due to everything Wing Chun includes being for self-defense. Ip Chun teaches still today at the age of 88 at one the most renowned Wing Chun schools in the world. In fact, Ip Chun is one of the founding fathers, alongside his father Ip Man, of the renowned Ving Tsun Athletic Association. One interesting aspect about Ip Chun is his interest in the real origins of Wing Chun. While he does seem to admire the legend surrounding Ng Mui, he delved further into Wing Chun history and learned about a man named Cheung Ng being responsible for some of the early Wing Chun forms. 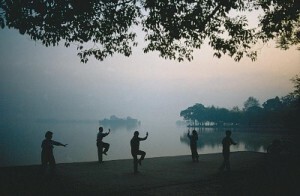 Cheung Ng, a Shaolin Temple student, was already excelling in martial arts before the temple was destroyed. Wing Chun was the form of martial arts being taught in secret as the best way to defend against the Manchus. Wing Chun training includes techniques promoting forward focus. Trapping and blocking for increased defense is based upon the alignment of an opponent’s bones, impeding strikes through jamming or trapping an opponent’s limbs. Bear in mind the movements are always in a forward motion, along with a pushing back of an opponent’s advances. Trapping techniques have been the debate of effectiveness in many other forms of martial arts. However, in a self-defense scenario, trapping an opponent for allowing the advancement of defensive strikes is highly effective. The greatest aspect of Wing Chun effectiveness is the event of defense and offense movements at the same time. Simple moves like Pak Sao, meaning a fast smack or Lop Sao, a pulling and jerking move, coupled with simultaneous strikes are extremely effective. Close range fighting can be treacherous in the self-defense scenario, especially with techniques like Biu Sau being used. Biu Sau describes the striking of soft areas like the neck, eyes and pressure points. Biu Sau techniques are designed to quickly take out an opponent’s abilities to strike altogether. Along with the natural reflex motion of Bong Sau, close range strikes form an opponent can be quickly evaded and stopped. During close range attacks, Ding Jarn is also used to avoid being taken down by an opponent. Ding Jarn is the use of the elbows as deflective protection through applied forward force. For many students of Wing Chun, the greater level of optimum health is an excellent benefit of Wing Chun training. The increase of coordination and the level of strength promoted through training sessions is great. Connecting the mind and body, especially during an attack in close proximity, is extremely important for success in defeating an attacker. The mind and body connection students learn under the training of an experienced sifu is amazing and can lead to control over many other circumstances in life that have nothing to do with fighting or self-defense. Students should always remember some self-defense is necessary in situations that involve opponents that are neither human nor animal for that matter. Many opponents include life issues that can be detrimental to a student’s well being just as much as being attacked by another person. Wing Chun training helps students to have greater levels of control over real life situations that can arise to provoke anxiety and stress. Another benefit of Wing Chun is the improvement of speed and reflexes experienced by students. Being faster and having greater reflexes can help to avoid falls or other accidents that could cause physical harm to the body. Simply being faster is an excellent benefit for avoiding spontaneous and disastrous accidents. An interview with Ip Chun when he was 84 is revealing about his thoughts of how Wing Chun produces a healthier mind and body. In fact, he believes the greatest benefit of this form of martial arts is all about the health benefits instead of the skills of being able to fight and defend oneself against an attacker. See video below for an interview posted in 2009, for an enlightening look into this form of martial arts by one of the greatest sifus known to the world. Taking the advice of Ip Chun and taking advantage of all the positive benefits of Wing Chun can allow an amazing transformation to take place in the mind and body of dedicated students.